Last edited by Francois Teyssier on Sat Aug 11, 2018 1:21 pm, edited 1 time in total. 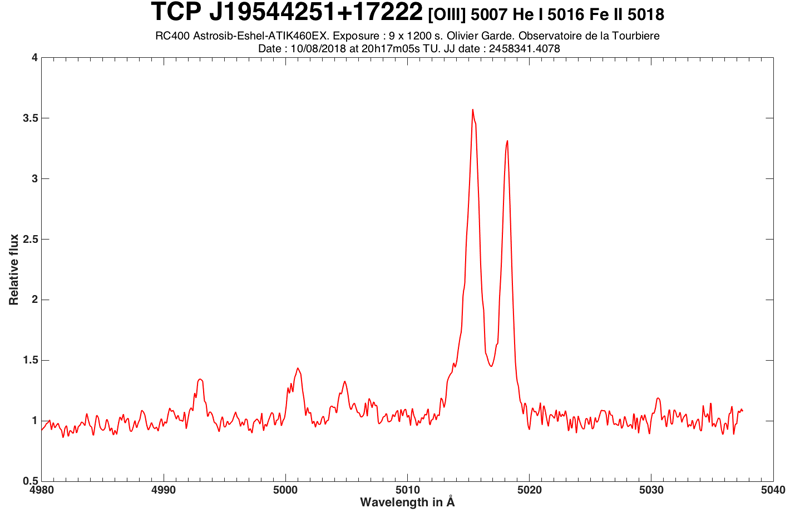 HBHa 1704-05 was first noted by Kohoutek and Wehmeyer in their catalog of emission line stars (1999, A&AS, 134, 255), as a source with a strong continuum (thus not a PN) and overexposed Halpha emission. It seems not much else is available in literature. 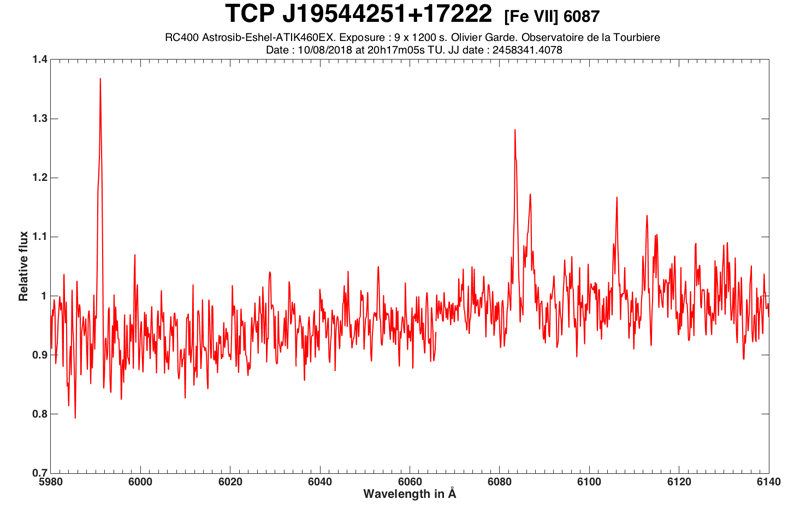 The star is coincident with 2MASS J19544295+1722125 (=ASASSN-V J195442.95+172212.6) catalogued by VSX (Otero 2018) as an SR variable with a periodicity around 418 days, and a range of variability 13.2-12.4 in V band. On patrol sky observations obtained with a Canon EOS 1000D plus 180mm focus lens, one of us (R.F.) recently noted a rapid increase in brightness amounting to (preliminary calibrated) V~12.0 on July 31.945 UT, V~11.7 on Aug 3.989, and V~10.7 mag on Aug 8.938. 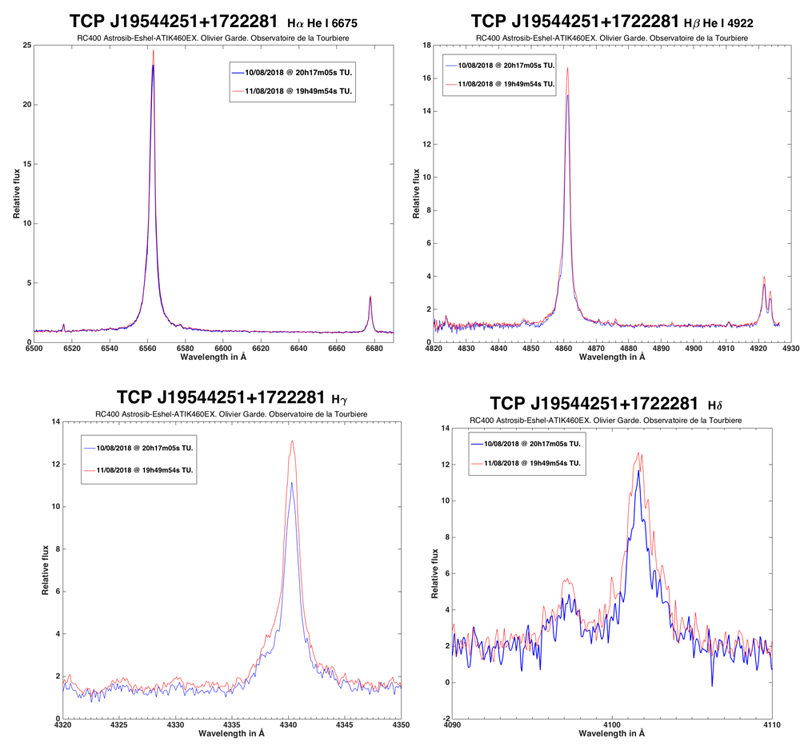 The trend was confirmed by inspection of the on-line ASASSN database. An exploratory spectrum was soon obtained on UT Aug 9.839 by one of us (P.B.) 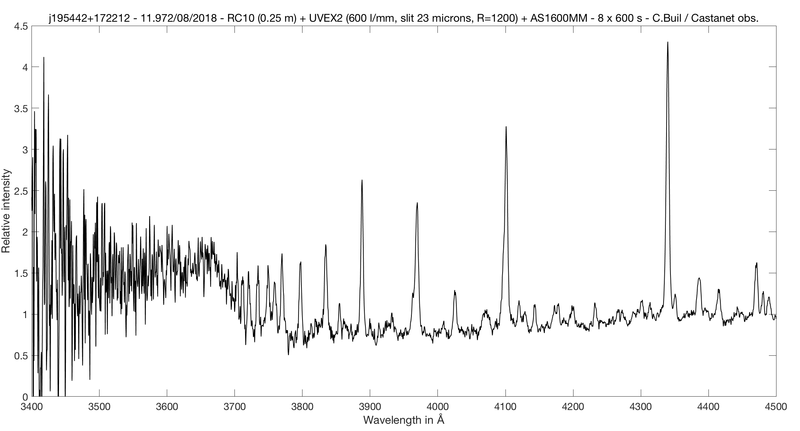 with a 23cm+Lhires III telescope, showing a rich emission line spectrum that prompted to collect deeper observations. 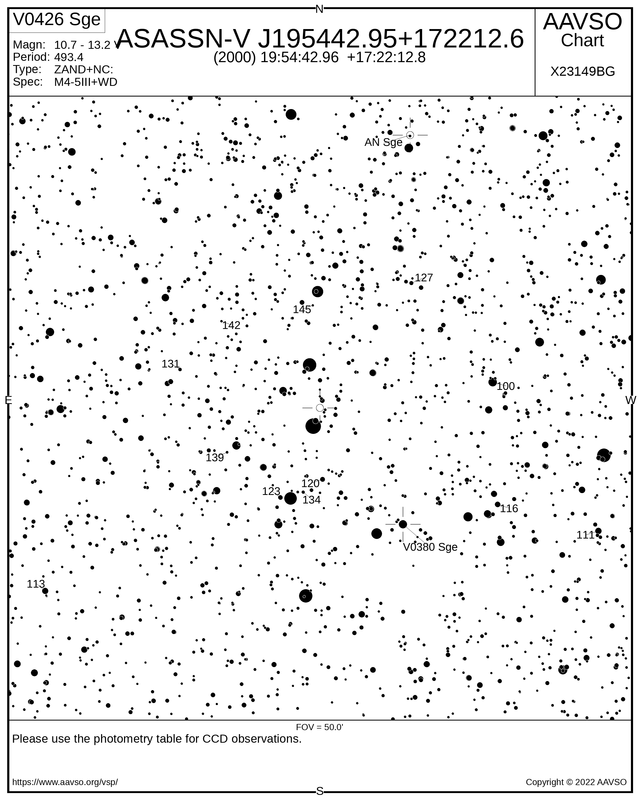 On UT Aug 10.837 we have observed HBHa 1704-05 with ANS Collaboration telescope ID 310 obtaining B=11.459, V=10.926, R=10.101, and I=9.199. Comparing with APASS mean values for quiescence, B=13.798 and V=12.637, the object is now 2.3 mag brighter in B and far bluer in color (from B-V=+1.16 to +0.53). 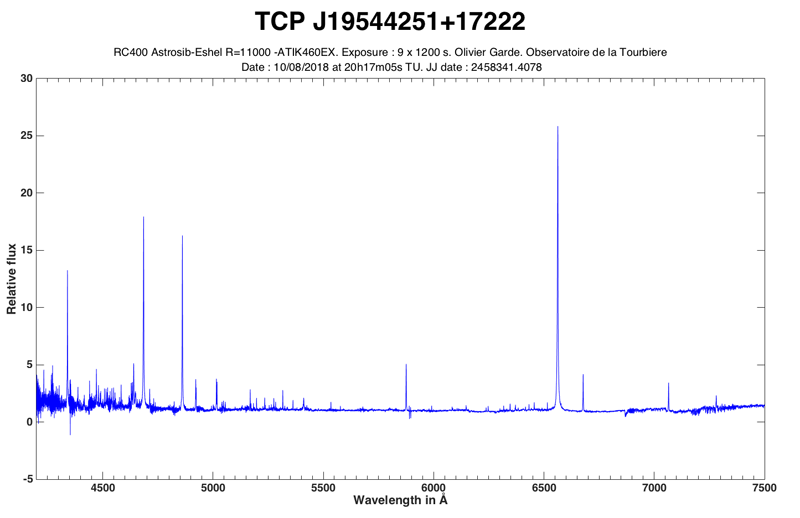 A deep 3200-7900 Ang spectrum of HBHa 1704-05 was obtained on UT Aug 10.855 at 2.31 Ang/pix dispersion with the Asiago 1.22m telescope, while the Varese 84cm provided a high resolution Echelle spectrum on UT Aug 10.882. 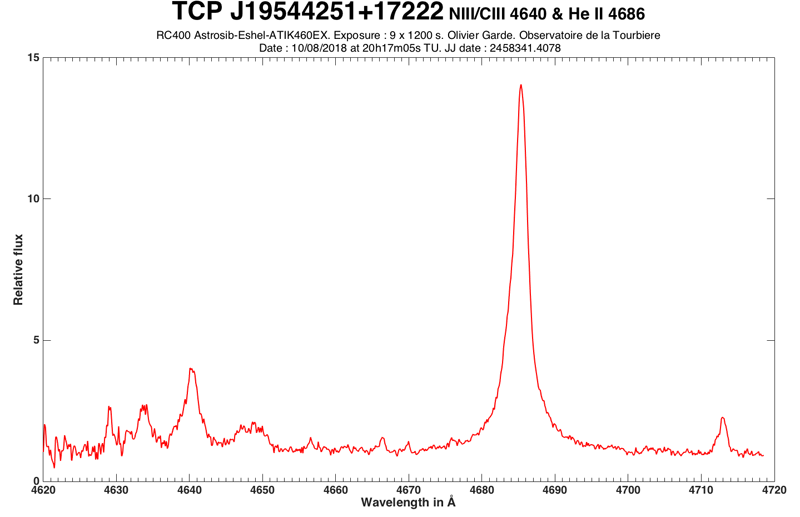 The spectrum of HBHa 1704-05 is characterized by TiO absorption bands from an M giant in the red, progressively veiled by nebular emission toward the blue, with a prominent Balmer continuum in emission. 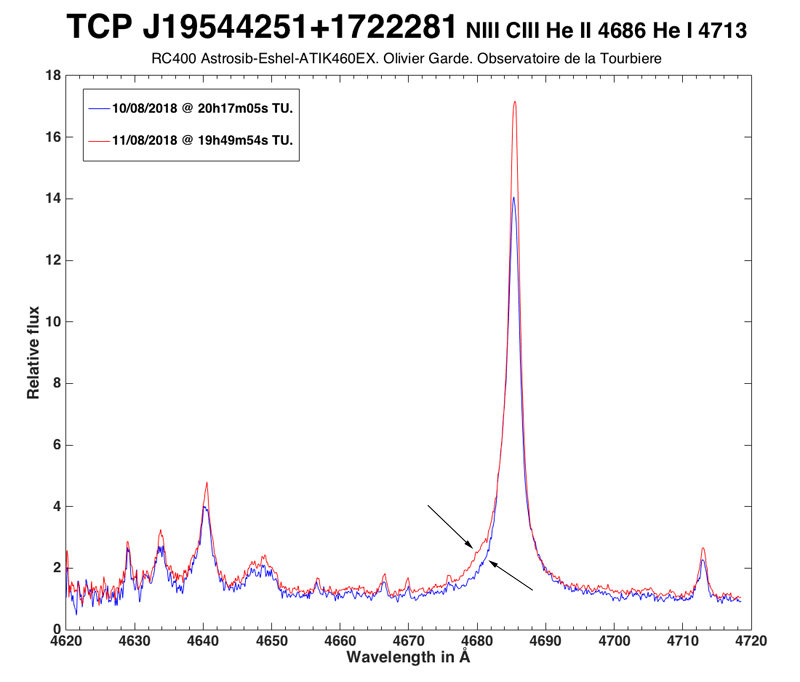 A lot of strong emission lines are present, with HeII 4686 of the same intensity of Hbeta, and [NeV] 3426 suggesting a photo-ionization temperature in excess of 100,000 K. A prominent NIII 4640 complex is accompanied by OIV 3411 and OIII 3313, 3429, and 3444, indicating that pumping under Bowen fluorescence, initiated by HeII Ly-alpha photons at 303.8 Ang, is active. 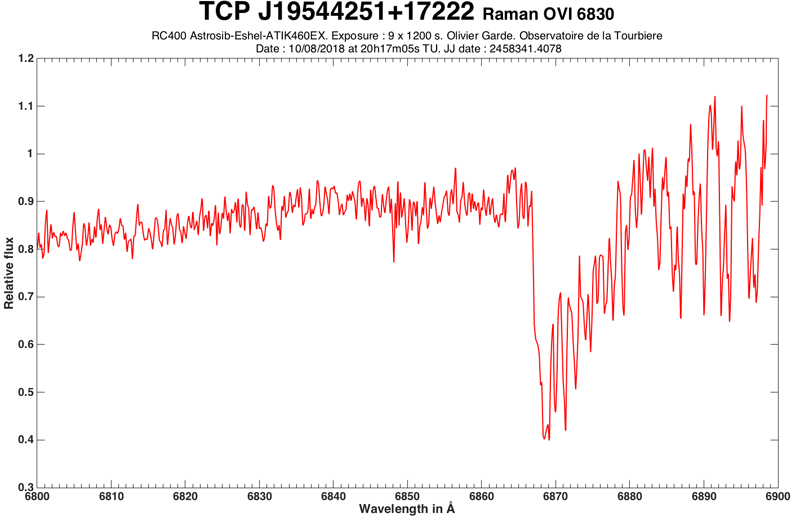 Forbidden lines characterized by a low critical density are absent, and also absent is the Raman scattered OVI pair at 6825, 7088 Ang. On the Echelle spectrum, the emission lines appear remarkably sharp and symmetric, without P-Cyg absorptions or other signatures of mass loss being visible, and with broad wings for the Balmer lines that suggest a large electron pressure. 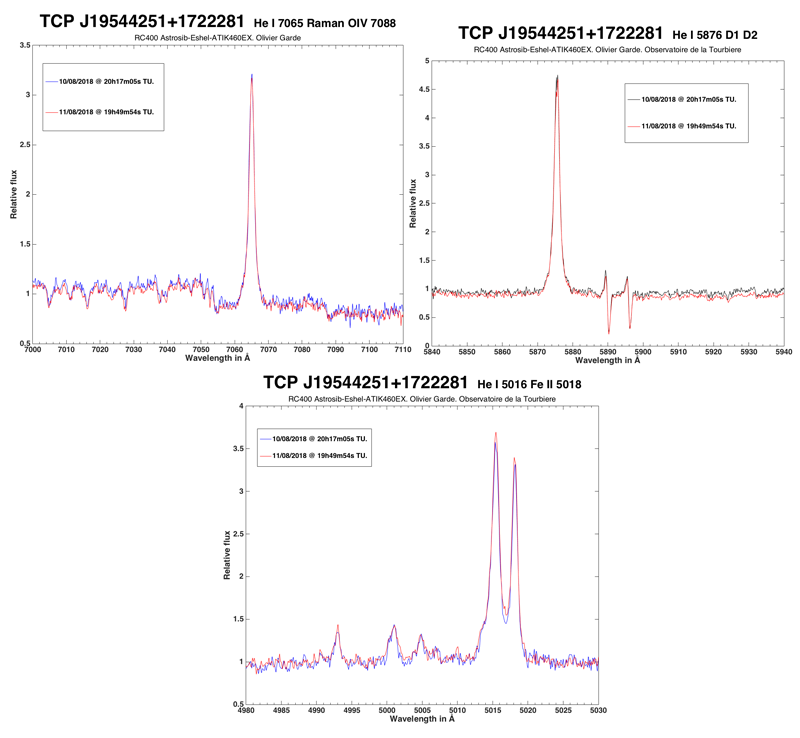 Bowen-pumped OI 8446 is present as are low-excitation emission from FeII multiplet 42, NaI D1,D2 and infrared CaII triplet. We therefore conclude that HBHa 1704-05 is a previously unknown symbiotic binary, currently undergoing an "hot-type" outburst, with the wind of the cool giant being increasingly ionized by a hot companion rising in Teff. 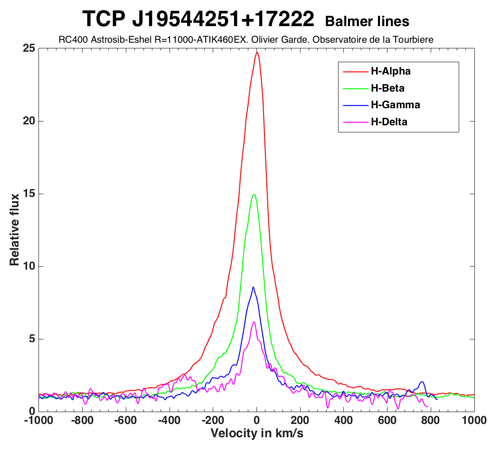 Its Gaia parallax suggests a distance of 3.6 kpc (albeit with a large error), and Schlafly et al. (2011, ApJ 737, 103) extinction maps indicate a reddening E(B-V)=0.28. The latter is confirmed by the low equivalent width for DIB 6614 and KI 7699. Combining APASS mean BVgri photometry in quiescence with 2MASS JHK data, a spectral type around M3III can be inferred for the M giant, in agreement with M(V)=-1.0 in quiescence from Gaia parallax. The large brightness attended by the ongoing outburst of HBHa 1704-05 and its favorable position on the sky will undoubtedly support a large, all-out observing effort, we plan to join. Merci pour ces informations François ! Voici ma contribution au suivi de TCPJ19544251+17222 obtenu ce 11 Août à 21 h 57 TU avec une résolution de 502 (JJ = 2458342.4374) et une durée d'acquisition de 40 min (8 x 300 s). Fresh results from yesterday with 300/1200 Newton + 2.67x APM Barlow + LHires 2400/mm, 35 micron slit, ATIK 428 EXm (2/3" chip size), provides R~9400 local resolution in the blue and R~1300 at 6000A. 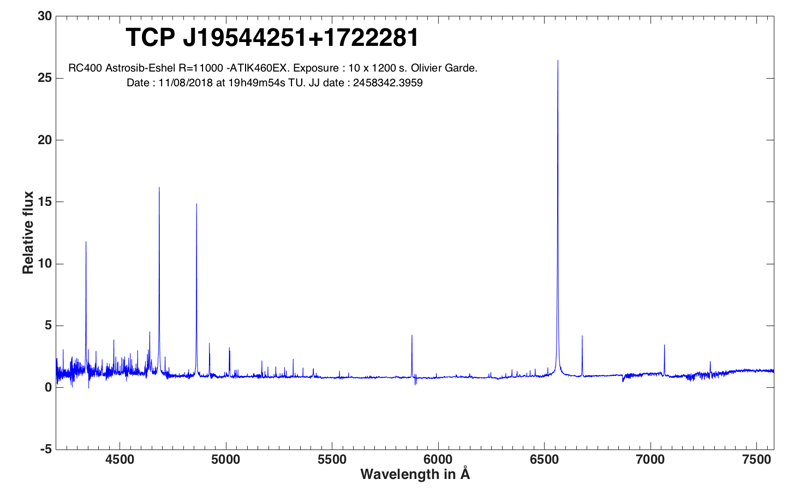 Sent spectra to database, including also a Hb + He I 4622 region that seem to already match well with Olivier's eShel spectrum above. yesterday I also observed the symbiotic with Lhires III and 600 l/mm grating. Fine Paolo and all ! Three explanations have been developped to explain the broad wings. There's no consensus.